There are a lot of unusual workplace hazards in manufacturing, many of which can lead to workplace injuries. With so many potentially catastrophic injuries on their radar, many companies overlook work-related musculoskeletal disorders (WMSD). But, according to the SHARP research group, work-related musculoskeletal disorder claims (mostly due to overexertion and repetitive motion) accounted for 21 percent of total state-funded disability claims from 2009–2013. That’s more than one in every five claims over a five-year period. In other words, overlooking WMSD in the workplace can be extremely costly and injurious to employees. If you want to reduce workplace injuries in general, musculoskeletal disorders are the easiest place to start. To reduce workplace injuries overall, begin by looking at injuries to the back, neck, and shoulders, which account for approximately 2/3 of manual material handling claims. Further statistics show that among WMSD claims, 55 percent are attributed to lifting. There are two types of lifting that are related to these disorders: heavy lifting and awkward lifting. While heavy lifting may seem obvious, repetitive or awkward lifting is often overlooked. So, what can employers do to reduce these types of injuries? A lot of emphasis is put on safe lifting and training, but even proper training alone doesn’t prevent injuries. There are things employers can do, in addition to proper training, to reduce the amount of WMSD in their facility. For instance, rather than store heavy materials on the floor, store them at waist level. This makes manual lifting far easier, with less potential injury to the workers who are doing the lifting. Replacing manual material handling with lift equipment can be most effective, but proper training and continuous pressure to adhere to changes in the workplace are key to its effectiveness. Ergonomic solutions, such as modifying existing equipment, implementing changes in work practices, and installing new tools and devices to assist in the production process can be the most effective means at reducing WMSD. Making ergonomic and lean manufacturing changes can reduce physical demands, eliminate unnecessary movements, reduce employee turnover, and lower injury rates and associated workers’ compensation costs. According to OSHA, implementing these changes can improve efficiency and productivity as well. To reduce the chance of manual-lifting injuries to employees, work tasks should be designed to limit worker’s exposure to ergonomic risk factors. 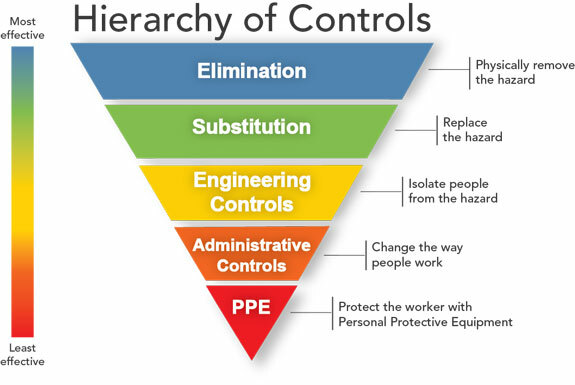 Engineering controls are the best way to reduce workplace injuries. Engineering controls are one way of introducing physical changes to the workplace that will eliminate or reduce at-work hazards. For example, using an overhead lift solution to lift and reposition heavy objects will limit force exertion to workers. Other examples of engineering controls are reducing the weight of a load to limit force exertion, repositioning a work table to eliminate long or excessive reaching and enabling employees to work in neutral positions. Companies can also make administrative and work place control changes to help reduce the number of workplace musculoskeletal disorders. Such controls consist of establishing more efficient processes and procedures. Examples of administrative controls include requiring that more than one worker lift and position heavy loads, establishing a system that allows workers to rotate away from tasks to minimize the duration of exertion, continual motions, awkward postures, and improper lifting in general. And, lastly, employees can implement personal protective equipment to reduce exposure to ergonomics-related hazards, such as using padding to reduce direct contact with hard or sharp surfaces and wearing thermal gloves to help in cold environments. Ergonomics and Musculoskeletal Disorders. National Institute for Occupational Safety and Health (NIOSH) Workplace Safety and Health Topics. Includes a variety of links with information about risk factors and solutions that help protect workers. EHSToday.com. Material Handling: The Secret to Reducing Workplace Injuries and Expenses. February 2016.